Riccardo Paterni has attended the opening day (April 25th) of the AutoChina 2018 auto show in Beijing. 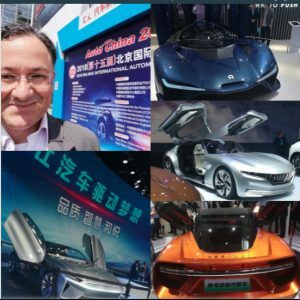 The sector is more dynamic than ever in China: set to have one of the global leadership position not only in operational but also technological ways necessary to ensure product efficiency, performance, reliability and overall appreciation within an Electric Vehicles framework that is booming. Innovation is a key focus from multiple perspectives that will be featured in the book. During the last few months electric motorsport has made several headlines: announcements of new series (among others several, and the number keeps rising: support series to the MotoGP, GT series, Global RallyCross Challenge); technical and commercial upgrades of present ones (see Formula E); new record seeking challenges in classic racing venues (see for example the VW prototype and the Pikes Peak hillclimb). We have come to associate electric motorsport to something innovative and futuristic; in actuality it is thanks to electric power that performance has begun to be associated with the emerging newly born filed of automotive at the end of the 1800s. On December 18th 1898 the French Count Gaston de Chasseloup-Laubat was the first protagonist of an officially recorded land speed record with an electric car made by stagecoach-maker Jeantaud; top speed reached 63,15kmh. Over the next few months a head to head duel among the Count and a the Belgian Camille Jenatzy (nicknamed ‘Diable Rouge’ – Red Devil – for his beard) was unfolded. On April 29th 1899 the ‘Red Devil’ set the new official land speed record by riding an electric powered CITA 25 ‘Jamais Contente’ – Never Satisfied – for the first time over 100kmh, exactly 105,88kmh. Yet battery charges represented the limiting factor and this became the last successful attempt to improve the record with an electric engine. During the next few years new technologies replaced electric power as a source of speed: steam (beginning in 1902, last record marked in 1906) and then internal combustion (beginning in 1902 onwards) engines took over the record making competition, the automotive market and altogether the progressively increasing number of motorsport events. During the late 1990s and early 2000s, new battery technologies have stimulated further research into electric power related to mobility and this has generated progressive investments into the field. Once again this has come to involve record seeking motorsport events to showcase the resurgent relevance of electric power (last year the NIO EP9 has conquered the overall best lap record at the legendary challenging Nurburgring track and has held the top spot for a couple of months). Electric vehicles are becoming so relevant (due also to important stands taken by several governments) that nearly all of the key global automotive manufacturers are making substantial investments driven by the need to boost electric energy efficiency in mobility while leveraging upon the levels of performance that electric power can generate. In a way we are going back to the relentless times of the ‘Red Devil’ and its ‘Never Satisfied’ electric powered land speed record car: we are living through an intense momentum of motorsport evolution and revolution from a technology, entertainment and also overall commercial point of view in which the ties of motorsport and mobility appear to be more relevant than ever. To note that several Italian small to mid sized companies have unique know-how and experiences that are contributing in important ways to the development of relevant electric motorsport projects. We will talk also about this during a conference that is going to be held in Rome on April 13th 2018 regarding the overall growth and development of companies involved in any motorsport format. At this link the introduction and flyer of the event illustrating its purposes and contents. As second part to the article (the previous is at this link) there are three aspects to point out: 1) the global dynamics context opportunities related to SMEs rooted in Motorsport, 2) along this way of thinking several direct links that the Motorsport Industry has with principles and practices of current and future manufacturing (Industry 4.0) and 3) tools that SMEs can utilise in order to maximise at best the expression and profitable utilisation of know-how developed and in development. Motorsport has historically been a sport and an industry driven at the national and only occasionally international level. Over the last few decades, along with many other sports and industries, motorsport , both as a sport and as an industry has felt the effects of globalisation. Formula 1 has led the way, with races being held on an increasingly global playing field over the last few decades. The industry has followed suit, where once it was beholden to Italy’s Emilia Romagna, focus changed to UK’s Motorsport Valley, and in the new millennia, an increasing globalisation of the motorsport supply chain across Europe into Asia and the Americas. Alongside globalisation has come industry diversification. Where once firms focused purely on the motorsport market, the realisation that the skills and competences inherent in motorsport have intrinsic value elsewhere, has led to motorsport firms entering new sectors as diverse as medical, aviation and defence. As a more articulated example on how the Motorsport Industry can relate to other fields in a dynamic and profound way we look at one of the latest key developments in manufacturing. This is represented by an overall productive system coined as ‘Industry 4.0 ”that can be defined as “the next phase in the digitization of the manufacturing sector, driven by four disruptions: the astonishing rise in data volumes, computational power, and connectivity, especially new low-power wide-area networks; the emergence of analytics and business-intelligence capabilities; new forms of human-machine interaction such as touch interfaces and augmented-reality systems; and improvements in transferring digital instructions to the physical world, such as advanced robotics and 3-D printing” (*). Advanced analytics – undertaken in real time in a continuous feedback loop to improve the performance of the vehicle while in a real time race situation. Human machine interfaces – the development of autonomous vehicles requiring a certain level of human oversight in specific circumstances is an area where motorsport firms TRL 4-7 (Technology Readiness Levels – see following paragraphs for additional information) capability can enable prototyping, and their long experience of one of the most extreme human/machine interacts offers opportunities for this technology to develop in an extreme environment – on the track. Digital to physical transfer – F1 teams have been using 3D printers for a decade on site at races and off site at factories. High level motorsport is renowned for its rapid prototyping, this shortening production time, and the increased use of digital to physical plays into the existing skills set of high level motorsport. Define the identity of the company, in other words: a) define the vision (the why it exists), the long term scope, the purpose of the enterprise (and we have seen as almost by default many companies in this industry can broaden the scope even within a strong focus on specific outputs); b) define the mission (the what it does), relevant to the vision and last but not least c) define the values (the how), the behavioural principles feeding mission and vision. Utilised some analysis tools (as for example SWOT, PESTLE, Porter’s 5 Forces analysis and Business Canvas) we specifically modified to the Motorsport Industry characteristics in order to shape up relevant Business Models concerning what is current and new scenarios relevant to the foreseen business development. Overall this will empower the company to gain a new perspective on the own capabilities given on know-how already present and know-how that could be readily developed given the very own characteristics of these SMEs from a technological and cultural point of view (again see the presentation and case studies above mentioned). has been developing since the late 1970s across several fields (Motorsport, Defence, Aerospace, Railways, Road Safety) in which Motorsport Research & Development can be considered as a common denominator. In the book, through an in depth interview with the charismatic company founder, Leo Cantergiani, we go to the roots of many innovations from very unique perspectives; this represent a source of inspiration and practical drive for any company that wishes to fully utilise its know-how for effective original impacts on markets. The field of high performance engineering, with a particular focus on the ones that relate to the Motorsport Industry, are going through global technological and business development changes. The right kind of mindset and strategic tools are essential to generate and utilise at best the opportunities that such changes generate. The enduring troubles in the working relationship between McLaren and Honda have brought to the attention of pundits and general public alike that organisational culture’s ways to work do matter when trying to establish a strong cooperations among entities that belong to different cultural and mindset contexts. Honda (appearing to have solved some of its performance and reliability troubles during the recent Malaysian Gran Prix) is betting again on its F1 future with a new partner, Toro Rosso. Lots of energy and positivity has been ritually declared within the announcement of the deal. James Key (Toro Rosso Director) has pointed out that “We look forward to a strong, stable and proactive partnership with our colleagues at Honda”, Takahiro Hachigo has stated “Everyone at Honda is looking forward to working with Toro Rosso, and we are excited to start this new chapter in our Formula 1 journey with them. (…) Honda and Toro Rosso will work as one team to strive for progress and a successful future together”. Two key words to watch for in these statements are ‘proactive’ and ‘one team’; if the two entities will manage to concretely put them into practice results will be reached. On the organisational culture topic Honda’s Motorsport General Manager has pointed out that things did not work out with McLaren because clearly Honda failed to reach the set goals of performance (reasons for which we have written about in previous articles) yet quite interestingly he states “What we have learned from McLaren is that they have a long history, the company is pretty big, everything is systematic and everything is sorted out so may be we can apply those systems, the way of thinking, into our development”. At the same time he states “On the other hand McLaren is sometimes too systematic. Because of the system they have, it is sometimes difficult to make small tweaks for improvements – it takes a bit of time. May be with Toro Rosso, they are small enough to make changes quicker”. Proactive, one team, a less systemic more flexible approach to change and development; they seem a possible recipe to reach targets that the ‘one-team’ will set. It is certainly evident that Liberty Media facilitated the deal in order to keep in F1 a relevant global automotive manufacturer. At the same time even this represents one of the many opportunities that is important to identify and catch. In High Performance Engineering and Motorsport’s management terms all of this becomes meaningful because it points out that today working with companies internationally requires setting up cooperative dynamic synergies ready to face continuos changes (caused by factors as market dynamics, budgets, new series that are attracting investments) and this requires a strong sense of cultural awareness to be utilised as a leverage to success. The question that any organisation should ask is: how do I need to create the specific value essential to a synergic success? To note that nowadays any lasting relationship with clients needs to be perceived from the perspective of a partnership where nothing is taken for granted. In other words how know-how assets are integrated in such partnerships in order to generate overall value and growth for all (achieving results on track is in these terms a metaphor for achieving results on any given market). Assumptions, at the roots of expectations, need to be spelled out from the beginning and rooted on facts and hard data as much as possible in order to integrate and synergies organisational cultures. 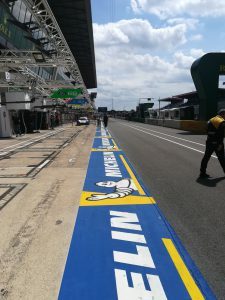 Recently Renault Sport Pierre d’Imbleval has illustrated a concrete example that illustrate these dynamics is the one relevant to the partnership between Renault Sport Formula One Team and Microsoft. Renault Sport has spelled out the key requirements: the need to use technology as an essential support to implement technical changes at an increasingly faster pace; the need to channel and elaborate at best data gathering; the need to share swiftly information among several departments in order to stimulate organisational cooperation. The pragmatism of Microsoft’s organisational culture has focused on these needs utilising technological solutions already available in its portfolio or customising new ones. All of this has strengthen Microsoft’s know-how by putting it to the test within one of the most challenging competitive environments while establishing in the process successful operational and branding synergies with Renault. Change is constant and relevant in any market, high performance engineering and Motorsport Industry in particular because of its very own nature. The leveraging power of clear assumptions, expectations and organisational cultural awareness are key aspects to manage for any Small and Medium Enterprise wishing to grow through the development of solid long term synergies with global organisations of any size. Updating and upgrading the way that business strategies are developed is part of the entire process and it will be described in the upcoming second part of this article. This AUTOSPORT Plus article, by the title ‘Why Formula 1 fans revolution is coming’ features a very interesting in depth review with #SeanBratches , Commercial Chief of #LibertyMedia #F1 project, on new ways to reshape the way F1 relates to the external world. It shows in how many different ways digital technology and focus on #userexperience (considering users fans and sponsors alike), many different #businessmodels (regarding several facets can be conceived and implemented in original disruptive ways). Time will tell if this is going to be effective in strengthening the global popularity and appeal of F1. One thought: we should make sure that these disruptions are compatibly implemented (in terms of budget and reach) also in other #motorsport activities. We cannot forget that most of the Motorsport, that involves actual fans on a global scale, is not F1. Possibly Alonso frustrations could be somewhat mitigated if he would have had the opportunity to meet a top innovator and industrialist within the automotive industry; able to found from the ground-up a corporation that has been defined ‘the most automotive innovative company in the world’. This industrialist famously stated: “Success, can be achieved only through repeated failure and introspection. In fact, success represents one percent of your work, which results only from the ninety-nine percent that is called failure.” The author of the quote is the late legendary founder of Honda: Soichiro Honda, a person that got along very well with Ayrton Senna during the glorious times of the McLaren-Honda partnership at the end of the 1980s and early 1990s. Mr.Honda was a very straightforward man, always looking for improvements and better performances of its creations. Possibly he could get along really well also with Alonso since he always sought feedback geared towards improvement. Honda has been repeatedly pointed out as one of the most advanced and innovative companies in the world as pointed out by the acclaimed book “Driving Honda. Inside the World’s Most Innovative Car Company” by Jeffrey Rothfeder. Is the Honda F1 power unit developing in the spirit of Soichiro (time is running out by now) or in actuality is the company unable to express its grip on innovation and continuous improvement that characterises the cultural legacy left by its colourful founder? Honda has a unique corporate culture that has been set by principles inspired by Soichiro’s way of thinking and doing things in a pragmatic, data driven, challenge seeking and inner organisationally inclusive way. These are Eastern mindset derived principles that leverage upon several factors. Jeffrey Rothfeder has analysed and identified: ‘individual responsibility over corporate mandates; simplicity over complexity; decision making based on observed and verifiable facts, not theories or assumptions; minimalism over waste; a flat organization over an exploding flow chart; autonomous and ad hoc design, development, and manufacturing teams that are nonetheless continuously accountable to one another; perpetual change; unyielding cynicism about what is believed to be the truth; unambiguous goals for employees and suppliers, and the company’s active participation in helping them reach those metrics; freely borrowing from the past as a bridge to what Honda calls innovative discontinuity in the present’. Soichiro Honda set this way of thinking that has become part of his legacy for a company that has grown step by step into a successful corporation in which people still represent a key factor, in fact ‘Honda’s factories are the least automated among carmakers, yet Honda enjoys the highest profit margins’. How can it be that an organisation characterised by such a distinctive culture, set to focus on decentralised problem solving and opportunity development, struggle so much on its F1 hybrid power unit project? When four years ago Ron Dennis promoted the new McLaren-Honda partnership it seemed that all was in place for a similar path (in the mid to long term) of the legendary repeated successes with Prost and Senna at the end of the 1980s and into the 1990s. This is not happening and besides possibly leading to the demise of Dennis from McLaren may actually lead Honda to eventually give-up on this currently draining F1 venture. Some key organisational aspects recognized as representing barriers to an effective development are represented by practices directly derived from the legacy principles above mentioned: a) problems need to be solved in a decentralised way but leveraging upon their very own resources in a way that they can learn from these precious experiences (and failures); b) because of the intrinsic challenges that F1 technology has, traditionally the company has considered the racing context as a relevant training field for engineers set to develop their expertise and know-how within the automotive field. This means that the input of outsiders has traditionally been avoided. Notwithstanding Honda’s approach to continuous improvement, the corporate approach, is quite far away in its implementation from the F1 one that it is needed. First of all it is to be noted that from a technical point of view from the beginning of the F1 project Honda has taken an unique original perspective on the power unit design and development. This does match the spirit of the company legacy but at the same time has hindered the effectiveness of the project mostly within a context in which testing restrictions and the token system have no doubt represented a barrier to the power units effective development. After several organisational restructures within the F1 operation and after opening up to external cooperation and help (at one point it was rumoured that even Mercedes came to the technical rescue of their project!) it seems a fact that the UK based engine specialist Illmor has been cooperating with Honda to solve issues more rapidly. It appears that at the Belgian GP it has not been possible to utilise the latest project upgrade that has been rumoured as output from this cooperation. It has also been pointed out that Honda’s commitment to F1 is ever increasing with an expanded and more independent (from the corporate system) site in Brackley. These decisions have been taken also in order to become suppliers to other F1 teams (in itself a way to accelerate project development) yet initial talks with Sauber and Toro Rosso have gone nowhere and there are still question marks about the partnership with Honda. The next races are going to be no doubt crucial to the overall project, as time is running out fast; ‘too little, too late’ could be the right kind of expression in this context. Organizational culture is the way to think through and do things on a daily basis, it is an action mode. It is always present whether or not it is openly affirmed. The key issue is that the more we are aware and we articulate it openly the more we can fine tune it to leverage on it effectively towards the set goals. In many ways Honda’s declared organisational culture seem to be matching in some aspects factors that are required in the fast paced, pragmatic, data driven F1 environment; in many others there is a clearly a mismatch of focus and overall objectives. Arguably a key issue here for the company is to push its legacy into the ever more complex context of business development towards ever more challenging targets; this is true both within the F1 environment as well as the automotive one that is set for a radical new technological and business model dawn. Legacies relate to values and values to be maintained and respected within new environments need new operational ways that still pivot on them. Honda with this current F1 project has the opportunity to utilise these experiences to upgrade the overall organisational culture; this would be in the spirit of the values and legacy set by Soichiro Honda. Yet as Bouiller has pointed out, time is the crucial factor in F1 and time (the implementation of innovation to market) is increasingly the crucial factor also in automotive. Time will tell if Honda catches this learning opportunity from the F1 culture; recently it has been reported that the corporation is in need of new approaches different from the ways it has been operating until now. A very recent article published in Bloomberg with the title ‘Honda’s Solo Act Turns Risky in the Alliance-Happy Auto Industry’ should sound as an alarm bell to top management. Given all of this dynamics it is going to be interesting to follow Honda’s organisational culture moves both in F1 and in automotive (and in both cases the time frame relates much more to the short rather than the mid term). HONDA’S ORGANISATIONAL ROOTS REPRESENT A TRAP TO ITS DEVELOPMENT ? #Honda within #automotive and #motorsport represents an interesting case study of an #organizationalculture traditionally set to not form industry #alliances in terms of research & development or commercial ones. An interesting article on the topic at this link. Great #motorsport #documentary : John Cooper: Genious At Work about #JohnCooper genius, the first person to focus on developing single-seaters rear engined. It all started with his genius by welding together two front end of the popular #FIATtopolino500 ! Cooper T51 and 52 Single seaters become rear engined!